A serene country retreat and four season destination. An historic estate on 150 private acres. A scenic country retreat on 150 private acres near Mt. Equinox in historic Arlington. 14 beautiful guest rooms in the Main Inn offer spacious suites, romantic fireplace rooms, screened in porches and beautiful views. The dining room, living room, tavern, library and game area give you lots of space to kick back, relax and socialize.Comfortable lodging and New England fare made with all the finest ingredients. Everything served is made with local farm fresh produce, free-range meats and poultry, seasonal game, Vermont artisan cheeses and home-baked breads and desserts. As long time members of the Vermont Fresh Network ( a partnership of Vermont chefs, farmers and food artisans) we are dedicated to supporting local agricultural and bringing the best of Vermont’s fresh, sustainable ingredients to your table. 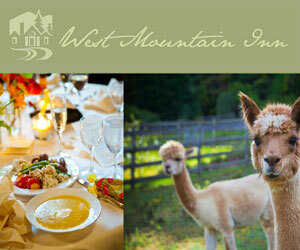 A highly recommended Vermont Inn and Restaurant. Ask us about Equinox area VT lodging. If you would like to add your Southern Vermont Country Inn, Lodge or Bed Breakfast Inn to this web site, please contact us.